Greetings everyone! Sincere apologies for the lengthy span between blog posts. Between crazy weather conditions that preclude getting out where I want to do some image making (in a safe manner), a brief period of time where I was not feeling great and just allowing life to get in the way, I have not been out very much the last couple of months. This past week, I was contacted on Instagram by someone who had liked a sunrise image I created last summer while up in Crested Butte. The image was titled “A Crested Butte Sunrise.” I had been on-location since about 1:30am, doing some night sky photography. As astro twilight and nautical twilight passed, civil twilight approached and the light was starting to show a lot of potential for sunrise! The location is on Trail 403, about 3/4 of a mile from the trailhead at the summit of Washington Gulch Road (CR-811). Elaina & I enjoy this trail and have passed a particular landmark along the trail that was the main focal point of the sunrise shot. A two seat bench…”Bill’s Bench” to be specific. Morning twilight came and the light and character-giving clouds were slowly rolling in. There was little doubt in my mind that I was in for a treat; I could feel the energy and the emotion unfold. I took a short break, just relaxing in one of the two seats and waited for sunrise time to arrive. When it was time, I got busy making sure my composition was set and everything would be ready for just the right moment to capture a gorgeous sunrise image. The light, the clouds, the setting, the emotion that the scene presented, was absolutely spectacular! After finishing up the sunrise shooting, I packed up my gear and trekked back to my 4Runner, so I could head down to Crested Butte and get some coffee at Camp4Coffee, make some breakfast before heading out to shoot wildflower images. A few months ago, my image was seen by the son of the person the bench is named after, but he had forgotten to DM me then. At any rate, he did DM me this past week and told me that he and his family had put the bench up as a memorial to his Dad, who passed away in 1999. 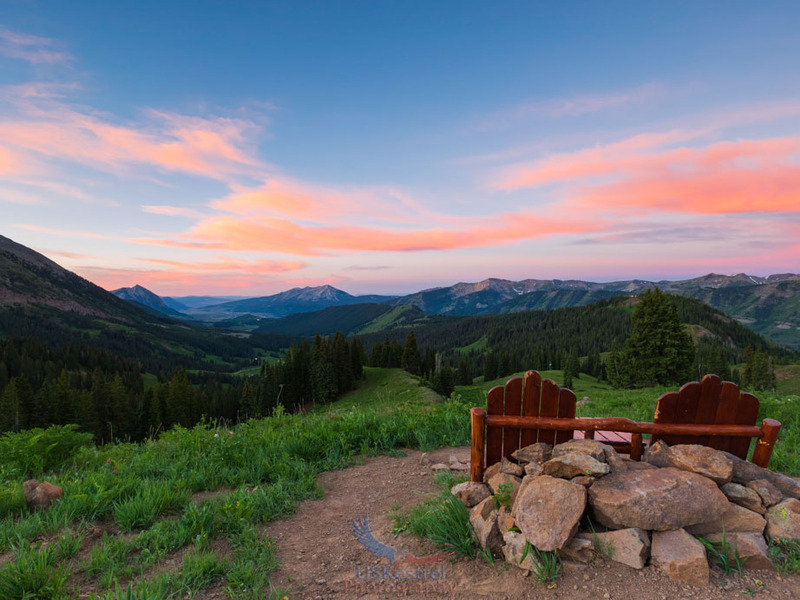 He thanked me for sharing that sunrise picture as the bench was put in that location just for the purposes of taking in those crazy Crested Butte sunrises and the magnificent views that are seen. That morning, from ~1:30am to a short while past sunrise, was so amazing! Knowing that my photography had evoked just the right emotion from people whom the bench and those views truly did mean everything, was a complete joy for me. As a photographer, our main job is to tell a story. I think this time, though, the story was told to me before I even knew what the story was to be told. One thing I can be certain of is that my passion for the great outdoors, for photography and for telling a story with my images has been bolstered quite a bit my the events of this contact!